Just when you thought there were no more superhero stories to tell, in swings Sony with a big-screen take on Spider-Man supervillain Eddie Brock, a.k.a. Venom. For those of you with short memories, that character was played by Topher Grace a few years back in Sam Raimi's Spider-Man 3. Grace wasn't asked to reprise his role for Venom; instead, Sony tapped Tom Hardy to play the symbiote-plagued journalist. Though the film is deeply flawed, it's often a lot of fun, and Hardy carries the schizophrenic nature of the narrative with a giddy sort of grace. Most critics have been quick to point out that the cast — which includes heavy hitters like Michelle Williams, Woody Harrelson, and Riz Ahmed — help to even out the madness. 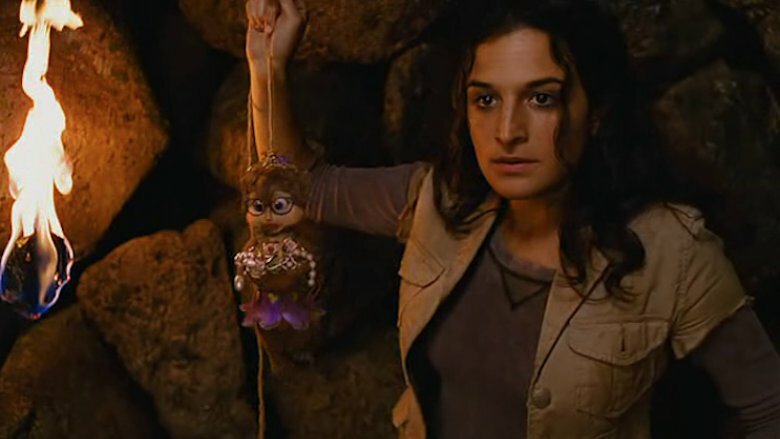 Among the supporting characters is a scientist by the name of Dora Skirth, played by the preternaturally gifted comedian/perpetually up-and-coming actor Jenny Slate. For those of you who are certain you've seen Slate's face before, you probably have — many times over. Here's why Dora from Venom looks so familiar. 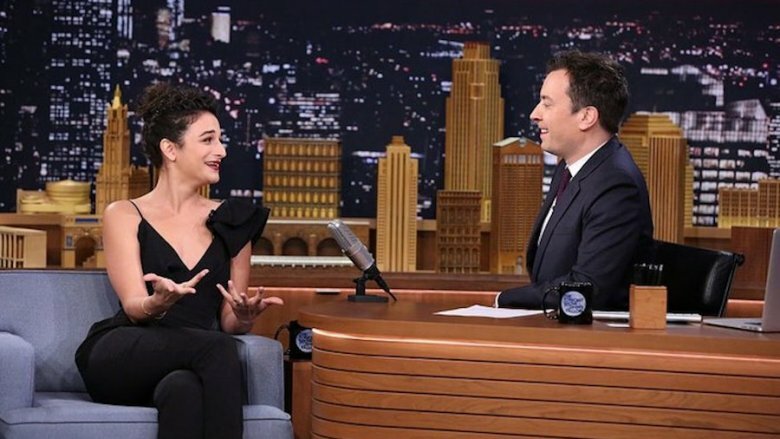 Like most up-and-coming actor/comedains, Jenny Slate cut her teeth on the New York standup scene, performing shows with longtime pals Gabe Liedman and Max Silvestri. That early work would eventually land Slate a prime, on-camera gig with VH1, where she regularly appeared on the show Best Week Ever. The combination of razor-sharp wit, stage presence, and screen experience eventually led Slate to her first real break in showbiz. That break came via a fellow comedian by the name of Jimmy Fallon. After navigating his own way through the standup landscape and rising to prominence during several seasons on Saturday Night Live, Fallon set his sights on the shark-infested waters of late night television, and he needed rising comedians to bring a few extra laughs to the mix. Slate more than fit the bill. She eventually landed a recurring role as Jenny the Page on the show's "7th Floor West" sketch, and introduced herself to audiences across America in the process. Now, she's sitting across from Fallon's desk as a star in her own right. After her late night break, it didn't take long for Slate to start booking more gigs, though some were bigger than others. One of her first post-Fallon jobs was an uncredited appearance in a music video by a a band called the Lonely Island. Yes, that Lonely Island — the Andy Samberg-led comedy pop group who'd been peppering Saturday Night Live with unapologetically lowbrow but snort-worthy digital shorts of original songs like "Lazy Sunday" and "I'm on a Boat." The video in question (which also features Ryan Reynolds and Elijah Wood in hilarious cameos) was for the absurdly titled "I Threw It on the Ground," which features Samburg mugging and rapping as he stomps around New York, throwing things on the ground with complete disregard for logic or reason. Slate didn't get to do any throwing — or singing or speaking, for that matter. She's mostly restricted to watching in dismay as Samberg smashes her cell phone on the ground because his "dad's not a phone, duh." You can see all the silliness right here. Even though it was a non-speaking role, Slate's appearance in "I Threw It on the Ground" may have helped her get on Lorne Michaels' radar and land an audition for the producer's long-running sketch comedy show Saturday Night Live. Slate joined the series as a featured player for the 35th season, playing dozens of memorable characters and garnering untold belly laughs along the way. Still, Slate's biggest SNL moment came during the debut episode of the season, which saw her drop an unsanctioned f-bomb on a live broadcast — in her very first sketch. While Slate made it through the show, and all 22 episodes of the 2009-2010 season, it seems possible that Michaels didn't forget the fateful faux pas: she wasn't invited back to SNL for a second season, but that probably turned out to be a good thing, as her career was about to get another serious boost. 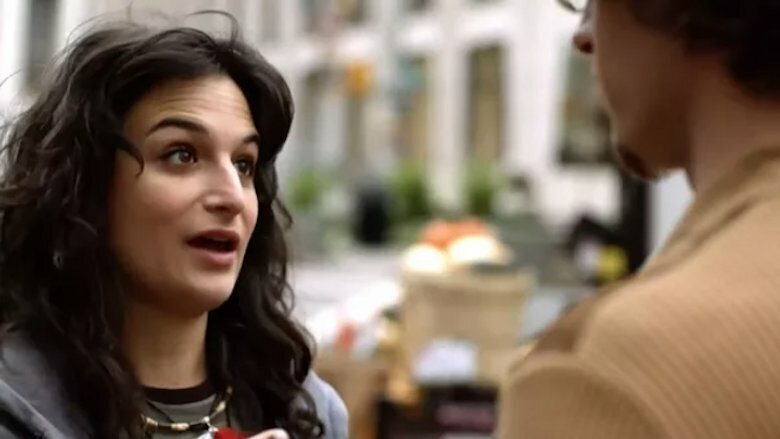 As it turns out, 2009 was a breakout year for Jenny Slate. Not only did she land that coveted (if all too brief) gig on Saturday Night Live, she also booked a recurring role on HBO's cult hit comedy series Bored to Death. For the uninitiated, the now-cancelled show followed the comedic adventures of a struggling writer named Jonathan Ames (played by Jason Schwartzman) who hires himself out via Craigslist as an unlicensed private detective. The series also featured the estimable comedic talents of Ted Danson and Zach Galifianakis, not to mention recurring cameos from indie talents like Zoe Kazan, Olivia Thirlby, Oliver Platt, Kristen Wiig, Isla Fisher, and many, many more. Slate's part on the series was a five-episode run as Jonathan's pot-smoking, organic co-op working, passing romantic interest Stella. In her appearances, Slate more than left her mark on a whip-smart, seriously funny show… that nowhere near enough people were actually watching. Keeping brilliantly busy in 2009, Slate also score a role in a short directed by an up-and-coming filmmaker named Gillian Robespierre. Billed as "a romantic comedy about an unplanned pregnancy, an abortion, and a great first date in an unlikely location," it saw Slate in her first lead role, playing a hip, funny young New Yorker faced in a precarious situation. It never really found an audience, but Robespierre spent the next few years developing it as a feature film. When she was ready to shoot, Slate proved more than eager to reprise the role. The pair brought Obvious Child to theaters in 2014, and gave the world the "abortion rom-com" it never knew it needed. Though Obvious Child didn't quite set the box office ablaze, the pair delivered a critical hit that put Slate's seemingly bottomless well of comedic and dramatic talent front and center. The film remains Slate's big-screen calling card, and helped establish her as an indie fixture — she's gone on to play roles in a series of low-budget features since, including Robespierre's underrated follow-up, Landline. Not all of Slate's film choices have panned out as well as Obvious Child. While much of her indie work has taken advantage of her crackerjack comedic talent and ability to bring the drama, there's been a big-budget misstep or two along they way — most notably, Slate's appearance in the critically maligned Alvin and the Chipmunks: Chipwrecked. There's nothing wrong with a talented up-and-comer trying to raise their profile by appearing in quality big-budget family-friendly fare, but Chipwrecked — the third film in the recent live-action/CGI iteration of the Alvin and the Chipmunks franchise — is not that movie. Raked over the coals by the pundits, this installment still managed to raise Slate's profile with a demographic that probably hadn't seen a ton of her earlier work: with more than $342 million in worldwide ticket sales, it's proof that all the critical acclaim in the world won't necessarily put butts in seats as easily as a trio of talking chipmunks. Of course, one of Slate's best known roles didn't come on the big screen at all. The spring of 2013 saw her take her talents back to television for a recurring role on NBC's hit comedy series Parks and Recreation, where she played Mona-Lisa Saperstein, the twin sister of series fave Jean-Ralphio Saperstein (Ben Schwartz) and soon-to-be romantic/ex-romantic interest of Aziz Ansari's wannabe player Tom Haverford. Over an uproarious 10-episode arc, Slate made the most of her supporting turn, smarming and sleazing and charming her way through one absurd moment after another, all in service of a character that would've played forgettably one-note in the hands of many actors. Somehow, Slate turned playing Mona-Lisa into an art form, building the character into a surprisingly well-rounded persona, stealing scenes from her incredibly funny castmates every step of the way and turning that one-note role into one of the series' most memorable supporting players. Scene-stealing turns on Bored to Death and Parks and Rec are hardly Jenny Slate's only memorable small-screen work. In 2012, she returned to HBO for what looked to be a single appearance on the first season of the cable network's hit series Girls. As far as one-off gigs go, Slate's work as Tally Schifrin — a former college nemesis of star Lena Dunham's Hannah — is sort of one for the ages. Slate has just one scene in the episode, but it contains an absolutely brutal yet sly war of words between the strong-willed pair that leaves both battered, bruised, and seemingly none the wiser about where they are in life. Four seasons later, Slate returned to the role — and completely stole the show her second time around. In a shrewd bit of scripting, Tally's return to Girls finds her and Hannah spending the day together, and realizing they have more in common than they thought, including an odd sort of envious respect that stems from very different places. Throughout the episode, Slate's warmth and emotional candor drive the action and help make the episode one of Girls' strongest. In doing so, she also makes Tally one of the show's most unexpectedly memorable characters. While Jenny Slate has made a habit of stealing scenes in supporting roles, she's been the star of the show more often than you'd realize. But don't worry if it isn't Slate's face you recognize in Venom, because you almost certainly recognized her distinctive vocals. 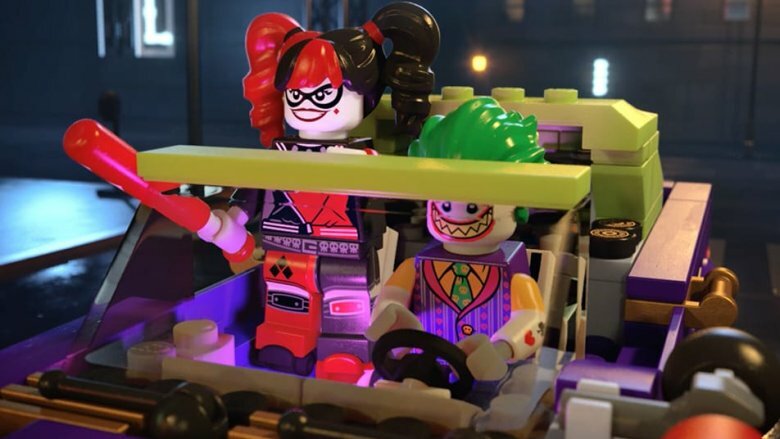 She's been one of the more sought-after voices in the entertainment biz of late, breathing life into characters in blockbusters movies like Zootopia, The Secret Life of Pets, and Despicable Me 3 — and her work as Harley Quinn in The Lego Batman Movie remains a standout in her voice acting career. As far as the small screen goes, you've heard Slate in animated fare like Cartoon Network's Adventure Time, Netflix's Big Mouth, the hit Fox series Bob's Burgers, and as Miss Nanny in the recent reboot of Muppet Babies. She's even the star of the online viral sensation Marcel the Shell with Shoes On. Of course, fans of Amazon's live-action series Comrade Detective — which you should absolutely be watching — will recognize Slate as the overdubbed voice of Jane. 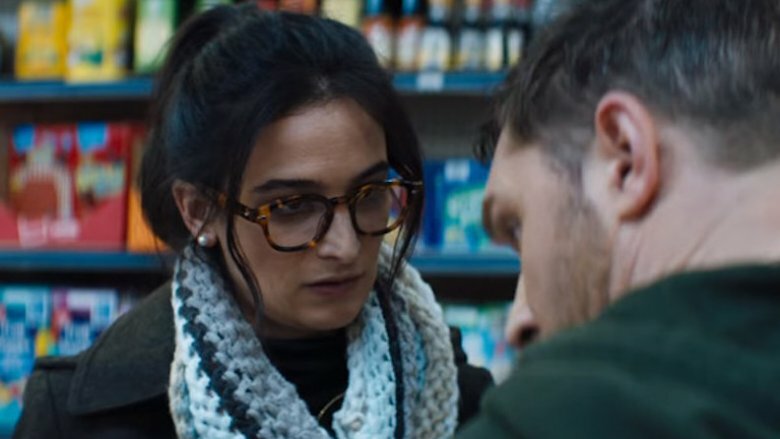 Whether Venom launches a franchise or ends up sending Sony's Spider-verse back to the drawing board, it's bound to help raise the profile of the absurdly talented Jenny Slate — and hopefully, the next time she turns up in a blockbuster movie, far fewer people will need to be reminded of all the places they've seen her before. As for what the future holds for Slate, she's still lending her voice to the latest seasons of Bob's Burgers and Big Mouth, and you'll have a chance to see her fall in love in the upcoming romantic drama The Sunlit Night (opposite her Bored to Death co star Zach Galifianakis), and you'll get to hear her voice an ark-bound animal in The Ark and the Aardvark. You'll also hear Slate reprise her role as Mitzy in the animated sequel The Secret Life of Pets 2. After that, the sky truly seems to be the limit for a performer of Jenny Slate's caliber, and we really can't wait to see what she gets into next.